Background: Injury-induced alteration in initial physiological responses such as hypertension and heart rate (HR) has a significant effect on mortality. Research on such associations from our country-India is limited. The present study investigates the injury-induced early blood pressure (BP) and HR changes and their association with mortality. Materials and Methods: The data were selected from Towards Improved Trauma Care Outcomes collected from October 1, 2013, to July 24, 2014. Patients above 18 years of age with documented systolic BP (SBP) and HR were selected. BP was categorized into hypotension (SBP <90 mmHg), hypertension (SBP >140 mmHg), and normal (SBP 90–140 mmHg). HR was categorized into bradycardia (HR <60 beats/min [bpm]), tachycardia (HR >100 bpm), and normal (HR 60–100 bpm). These categories were compared with mortality. Results: A total of 10,200 patients were considered for the study. Mortality rate was 24%. Mortality among females was more than males. Patients with normal BP and HR had 20% of mortality. Mortality in patients with abnormal BP and HR findings was 36%. Mortality was higher among hypotension-bradycardia patients (80%) followed by hypertension-bradycardia patients (58%) and tachycardia hypotension patients (48%). Elderly patients were at higher risk of deaths with an overall mortality of 35% compared to 23% of adults. Conclusion: The study reports that initial combination of hypotension-bradycardia had higher mortality rate. Specific precautions in prehospital care should be given to trauma patients with these findings. Further prospective study in detail should be considered for exploring this abnormality. The assessment of vital parameters helps to understand the physiological response and their appropriateness to injury response in trauma patients' injuries and depending on the status of compensation helps to decide the management strategy.,,, Traditional vital signs (systolic blood pressure [SBP], heart rate [HR], and respiratory rate) can be measured noninvasively and has been routinely used for initial assessment of trauma patients.,, This study takes a review of on admission blood pressure (BP), HR among trauma patients and their impact on in-hospital mortality. Data considered from prospective, observational, multicenter trauma registry – Towards Improved Trauma Care Outcomes (TITCO) from four Indian City Hospitals. TITCO data collection was carried out from October 1, 2013, to July 24, 2014. Patients with a valid recording of HR and BP on admission are considered for this study. Only patients with age more than 18 years were included in this study. HR records were further grouped as tachycardia, bradycardia and normal for the readings below 60 beats/min (bpm), above 100 bpm and 60–100 bpm respectively with units' bpm. Similarly, SBP recorded were grouped as hypertension, hypotension, and normal BP for respective reading SBP values of below 90 mmHg, above 140 mmHg, and 90–140 mmHg. Overall survival of trauma patient was compared with SBP and HR groups. TITCO registry patient's details were available till discharge or death, during admission. Admission HR and SBP was then compared with mortality. Data were analyzed using SPSS version 24.0 (SPSS Inc., Chicago, IL, USA) for Windows and Microsoft Excel version 2016. Contingency table of HR versus SBP was prepared, in each category, patients were defined in percentages. Among death and survived patients separate estimates were shown. Primary and secondary variables under consideration were analyzed to estimate statistical parameters including mean, standard deviation, and percentages. Logistic regression analysis was performed assuming Pulse and BP as an independent variable with life outcome as the dependent variable. P < 0.05 was considered as a statistically significant. Of 16,047 patients in the TITCO registry, 10,200 adult patients (>18 years) were considered for analysis with valid records of HR and SBP. Overall mortality was 24% (2438/10,200) among patient under consideration for this study. Males were at higher risk of trauma (82%) than that of females (18%). The overall mortality was 23% and 28% for males and females, respectively. 75% (7657/10,200) trauma patients had normal parameters of their HR and SBP on admission, overall mortality among them was 20% (1526/7657). While among remaining 25% (2543) patients overall average 30-day mortality was 36% (912/2543). The highest risk was associated with hypotension-bradycardia patients with 80% mortality, followed by 58% (n/d) in hypertension–bradycardia patients, then 48% (n/d) in tachycardia hypotension patients [Table 1]. At least one normal record either of HR or BP was seen to be associated with 30-day mortality of 29%–44% (n/d). Both abnormal, HR and BP on admission were seen to be associated with 56% (n/d) mortality, while at least one abnormal count was associated with 35% (n/d). Whereas the trauma patients with normal BP and pulse; the overall mortality was 20% (1526/7657). Elderly patients (>60 years) were at higher risk of deaths with an overall mortality of 35% (n/d) compared to 23% (n/d) of adults. However, adults were 90% (n/d) of total trauma victims while elderly were 10% (n/d). 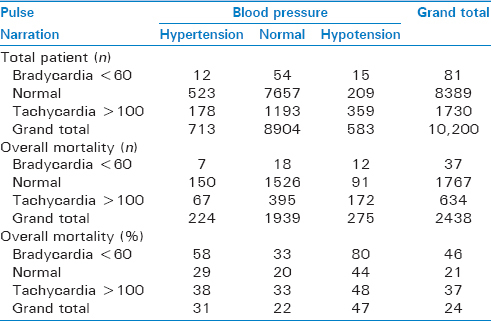 A total of 12 patient had combination of hypertension (BP >140 mmHg) and bradycardia (HR <60 bpm) [Table 2] and [Table 3]. All the patients were adults male. All the patients sustained blunt injuries except one who had a penetrating injury to the chest wall and mediastinum. Six patients were intubated; three patients underwent neurosurgical intervention, evacuation of the mass lesions and decompressive craniotomy. It has been suggested that routine physiological parameters can be used to predict mortality in patients with traumatic brain injuries,,, however, the predictive value of these vital signs has been questioned in many studies.,, BP, and other vital signs HR and respiratory rate have been shown to play an important role in the initial evaluation of trauma patients.,, SBP has been shown as an important clinical marker to indicate trauma severity and included in many trauma scoring systems. SBP of 120 mmHg has been considered as normal in the adult population,, and a value <90 mmHg is considered as hypotension., Many studies have shown that hypotension as well as hypertension are associated with reduced survival in trauma patients,, particularly increased short-term (we need to define this – is it early mortality <24 h) mortality. SBP of 110 mmHg is associated with significant increase in mortality and for every 10 mmHg reduction in SBP increases the risk of mortality by 4.8%. Hypotension can be a reflection of decompensation of the physiological mechanisms (30%–40% loss in blood volume) and needs to be considered a late finding. Classically, the “Cushing reflex” or “Cushing's triad” has been described as the presence of hypertension, bradycardia and abnormal breathing in a patient with raised intracranial pressure. In animal studies, it has been shown that the occurrence of the bradycardia is preceded by initial tachycardia and hypertension. The Cushing reflex is body's mechanism to increase the mean systemic arterial pressure and thus to restore an approximately normal blood flow to cerebrum., Kalmar et al. reported that the occurrence of Cushing reflex depends on the underlying pathology and may take hours, days or months (depending on the rate of increase in the pathology) and almost all the patients have bradycardia and hypertension at presentation. We noticed the combination of bradycardia and hypertension in 12 cases (11 head injury and one case of penetrating chest injury), and none of them had respiratory abnormalities. The possible mechanism of bradycardia and hypertension can be irritation of the vagus nerve in the mediastinum. The present study helps to understand the pattern of BP and HR in a subgroup of the population of trauma in India. It also highlights bradycardia patient and their relatively high-risk groups. A series of reports has suggested that BP offers prognostic information relevant to trauma-related injuries.,,, The study result reports that associative risk seen in the patients of trauma based on the data collected from the trauma registry in the Indian settings. It also highlights the prevalence of hypertension and bradycardia with altered respiration in the patients of head injury, thereby providing with the occurrence of Cushing's reflex. There is an association between relative risk (RR) and traumatic brain injury., However, we did not identify any significant relationships involving RR. Possibly, the patients in this data set with respiratory depression were intubated early, and thereafter their RR was under control of the caregivers, not dependent on the patient's own depressed respiratory drive. This study does not take into account the details of prehospital treatment and the details of resuscitative measures (intravenous fluids). There were also no details of the medications received by the patients, for example, for pain and analgesia; however, it is being reported that these medications may not hamper the results of BP and HR as these have no adverse effect on the cardiovascular response. Another limitation for the present study is that we do not have the details whether these patients had a history of hypertension in the past and or were receiving any medications. The present study reports that patients with bradycardia and hypo- or hyper-tension had higher mortality percentages. The study supports that understanding initial altered physiological findings might be helpful in prognosticate the outcome in patients who present in the emergency room for trauma care. To better understand the relationship between admission HR and admission BP there will be a need for a well-planned prospective study. This study was funded by grants from the Swedish National Board of Health and Welfare and the Laerdal Foundation for Acute Care Medicine. Clifton GL, Robertson CS, Kyper K, Taylor AA, Dhekne RD, Grossman RG. Cardiovascular response to severe head injury. J Neurosurg 1983;59:447-54. Little RA, Kirkman E, Driscoll P, Hanson J, Mackway-Jones K. Preventable deaths after injury: Why are the traditional 'vital' signs poor indicators of blood loss? J Accid Emerg Med 1995;12:1-14. McMahon CG, Kenny R, Bennett K, Kirkman E. Modification of acute cardiovascular homeostatic responses to hemorrhage following mild to moderate traumatic brain injury. Crit Care Med 2008;36:216-24. Greve MW, Zink BJ. Pathophysiology of traumatic brain injury. Mt Sinai J Med 2009;76:97-104. Bruijns SR, Guly HR, Bouamra O, Lecky F, Wallis LA. The value of the difference between ED and prehospital vital signs in predicting outcome in trauma. Emerg Med J 2014;31:579-82. Bruijns SR, Guly HR, Bouamra O, Lecky F, Lee WA. The value of traditional vital signs, shock index, and age-based markers in predicting trauma mortality. J Trauma Acute Care Surg 2013;74:1432-7. Loizou E, Bouamra O, Dark P, Martin B, Lecky F. Comparing the systolic blood pressure (SBP) and pulse rate (PR) in injured children with and without traumatic brain injury. Resuscitation 2010;81:418-21. Roy N, Gerdin M, Ghosh S, Gupta A, Kumar V, Khajanchi M, et al. 30-day in-hospital trauma mortality in four urban university hospitals using an Indian trauma registry. World J Surg 2016;40:1299-307. Reisner AT, Khitrov MY, Chen L, Blood A, Wilkins K, Doyle W, et al. Development and validation of a portable platform for deploying decision-support algorithms in prehospital settings. Appl Clin Inform 2013;4:392-402. Butcher I, Maas AI, Lu J, Marmarou A, Murray GD, Mushkudiani NA, et al. Prognostic value of admission blood pressure in traumatic brain injury: Results from the IMPACT study. J Neurotrauma 2007;24:294-302. Reisner AT, Chen L, Reifman J. The association between vital signs and major hemorrhagic injury is significantly improved after controlling for sources of measurement variability. J Crit Care 2012;27:533.e1-10. Chobanian AV, Bakris GL, Black HR, et al. The Seventh Report of the Joint National Committee on Prevention, Detection, Evaluation, and Treatment of High Blood Pressure: The JNC 7 report. JAMA. 2003 21;289:2560-72. Kassavin DS, Kuo YH, Ahmed N. Initial systolic blood pressure and ongoing internal bleeding following torso trauma. J Emerg Trauma Shock 2011;4:37-41. Surgeons CoTotACo. Resources for Optimal Care of the Injured Patient 2006. Chicago, IL: American College of Surgeons; 2006. Ley EJ, Singer MB, Clond MA, Gangi A, Mirocha J, Bukur M, et al. Elevated admission systolic blood pressure after blunt trauma predicts delayed pneumonia and mortality. J Trauma 2011;71:1689-93. Zafar SN, Millham FH, Chang Y, Fikry K, Alam HB, King DR, et al. Presenting blood pressure in traumatic brain injury: A bimodal distribution of death. J Trauma 2011;71:1179-84. Eastridge BJ, Salinas J, McManus JG, Blackburn L, Bugler EM, Cooke WH, et al. Hypotension begins at 110 mm Hg: Redefining “hypotension” with data. J Trauma 2007;63:291-7. Cushing H. The blood-pressure reaction of acute cerebral compression, illustrated by cases of intracranial hemorrhage. Am J Med Sci 1903;125:1017-43. Heymans C. The control of heart rate consequent to changes in the cephalic blood pressure and in the intracranial pressure. Am J Physiol Leg Content 1928;85:498-506. Beiner JM, Olgivy CS, Du Bois AB. Cerebral blood flow changes in response to elevated intracranial pressure in rabbits and bluefish: A comparative study. Comp Biochem Physiol A Physiol 1997;116:245-52. Kalmar AF, Van Aken J, Caemaert J, Mortier EP, Struys MM. Value of cushing reflex as warning sign for brain ischaemia during neuroendoscopy. Br J Anaesth 2005;94:791-9. Kong RS, Wood PR. Sinus bradycardia associated with traumatic haemothorax. Br J Anaesth 1994;72:358-60. Anderson WP, Denton KM, Woods RL, Alcorn D. Angiotensin II and the maintenance of GFR and renal blood flow during renal artery narrowing. Kidney Int Suppl 1990;30:S109-13.